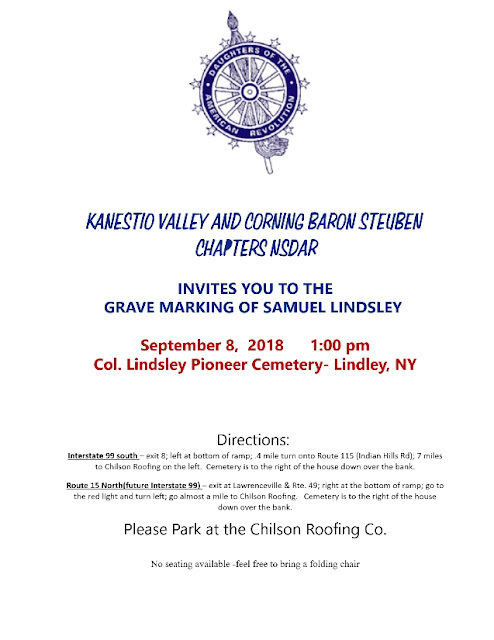 Please join the Lindsley Family Descendants and their families as they honor their ancestor. Samuel Lindsley -the youngest son of Colonel Eleazer Lindsley who served in the Revolutionary War along with his father and 2 brothers-in law. . Colonel Lindsley, his two sons -in-law -Mulford and Seelye have been honored previously for their contributions in 1914, 2003 with plaques in the Lindsley Burying Ground and in 2016 with the Cemetery Roadside Marker from the Pomeroy Foundation . However, it wasn't until about 3 years ago that the 4th Gt.Grandson of Samuel, Phillip Cirulli undertook the task of researching the record of this ancestor that proved Samuel had served.